ROG even gives you a certificate telling you how awesome you are! Inside the box, there’s a protective carry case, the dock, braided USB cable, fancy ROG stickers, made in Japan OMRON switches, and a hex screw for opening up the mouse. The thing that impressed me is the numerous choices offered. Not only do you get to choose between wired and wireless modes, you can customize the LED colours, the stickers on the mouse, the 12 buttons, all the way down to the switches. 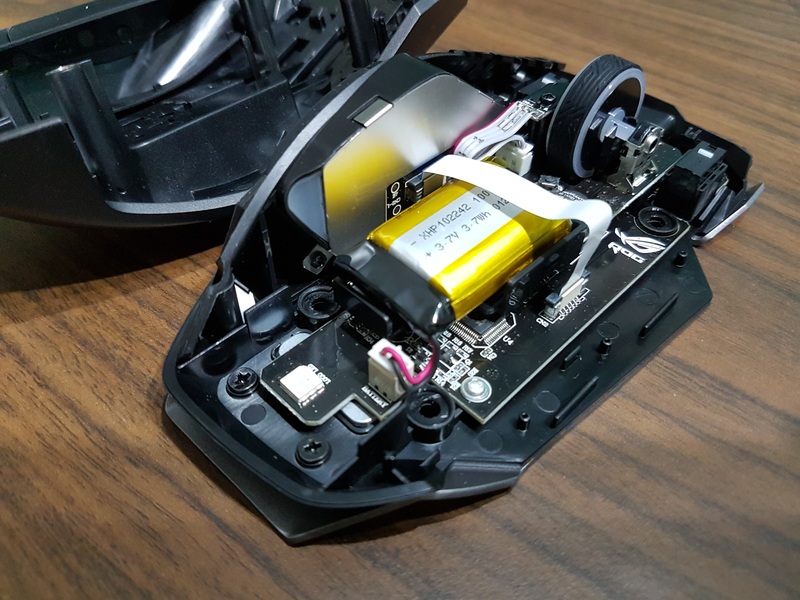 By default, the mouse is installed with Omron D2FC-F-7N switches with 60gf (operational force) which are good for 20 million clicks (if you were wondering, that should last more than 50 years). The extra switches are Japanese-made (D2F-01F) and offer 75gf for a different click feel and lasts for at least a million clicks. I tried replacing the switches, and yes, it was easy-peasey. It can be done in less than 15 minutes and in 3 simple steps. ASUS kept to the same Mayan-inspired theme as their other ROG lineup, with it similarly being applied to the Spatha. It is quite a big mouse, and is unabashedly for the right handed gamers. It was a tad heavier than I preferred, but I was able to configure the dpi so that snappy hand flicks can still be registered easily. 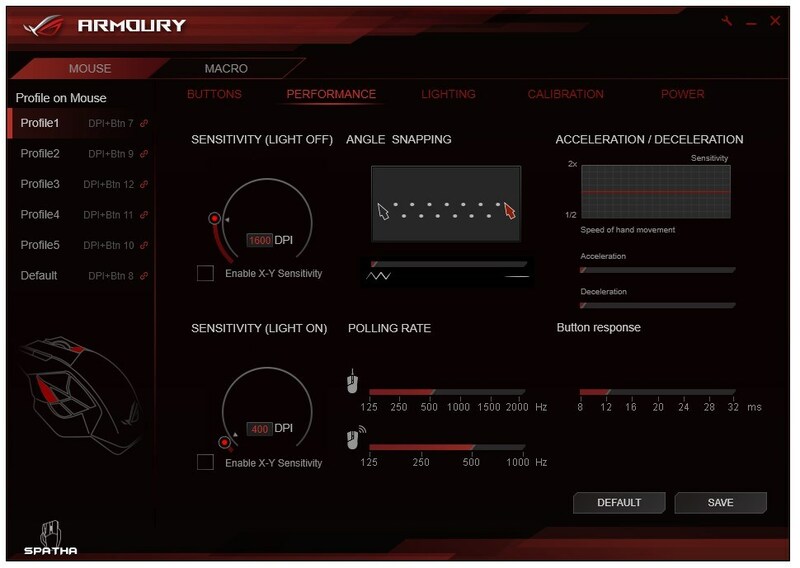 The ROG Armoury software is feature packed, and everything from angle snapping, acceleration, deceleration, lift-off, button response, polling rate and more, can be tweaked. If you are still getting fragged (badly), then maybe it’s not the gear you should be looking at. 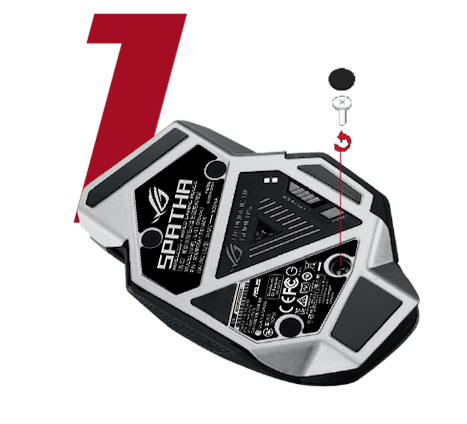 Gamers have this crazy obsession with LEDs, and the Spatha doesn’t disappoint with three RGB lighting zones, that can be customised individually as well as the lighting pattern. As mentioned earlier, there are 12 fully programmable buttons, through the ROG Armoury app, with six on the thumb rest. The 6 buttons are perfect for games such as DOTA 2 with quick cast / items to be triggered. It might look messy, but each button is uniquely shaped which helps in muscle memory on which button is which. Also, the shape is contoured to your thumb such that minimal movement is required to trigger the various buttons. There’s no fumbling around in heated gaming moments when a second delay to activate the potion is the difference between life and death. 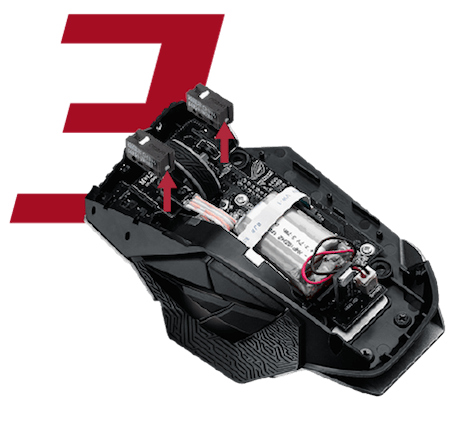 As mentioned, the mouse can be used in both wired and wireless modes, and the ROG Spatha is smartly designed such that the USB port is recessed, and propped slightly up, so that the cable doesn’t drag or bunch at the front of the mouse. The included charging dock is a great way to show off your epic-looking mouse, at the same time keeping your table neat and adding some pizzazz to your table. 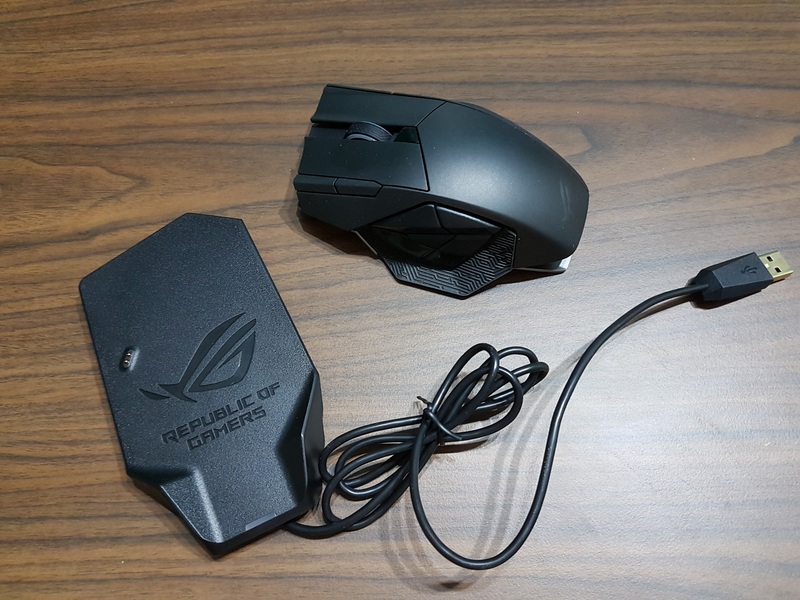 Initially, I thought the ROG Spatha would be more of an MMO Mouse, but after testing it, I think it’s a great all round gaming mouse, thanks to the multiple options available. Games with requirements for multiple commands work well with the Spatha thanks to the easily accessible side buttons. I generally prefer using it in the wireless mode, cords messes the look on my table. That said, performance in wireless mode was excellent for me. I played a mixture of FPS to try out the responsiveness, and the wireless mode was as good as the wired mode. 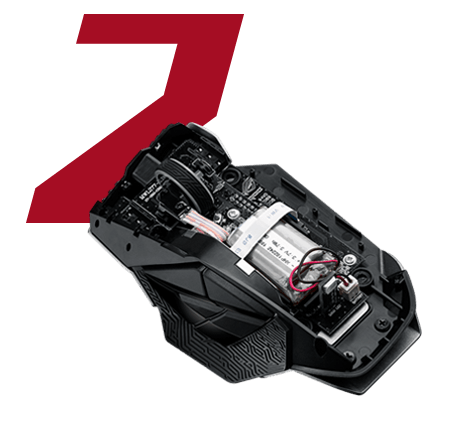 Cool looks aside, my personal preference is for a heavier mouse and the Spatha ticks those boxes in terms of comfort and stability for gaming. Price is on the high side – at about $250 – tip: buy the ROG Spatha from Qoo10, and combine an item and cart coupon for up to $25 off. 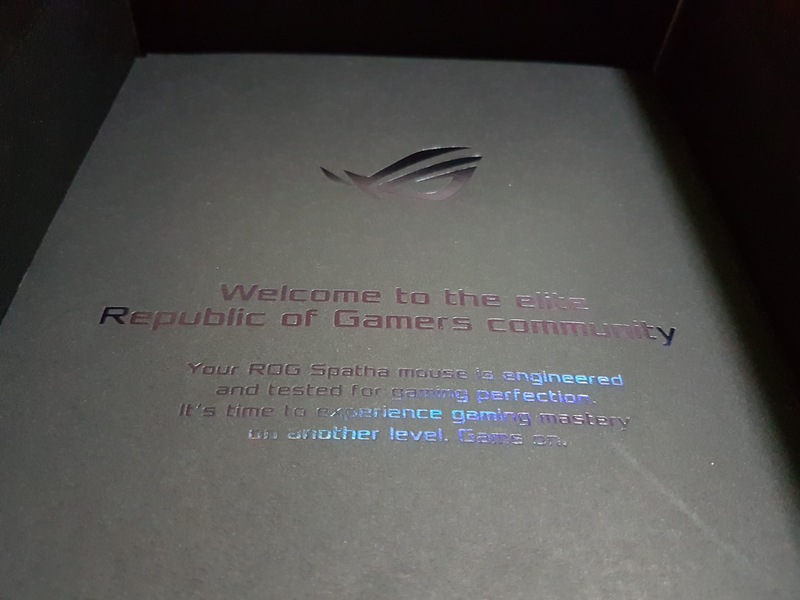 I recently saw on ASUS Facebook page of the new ROG Sheath. The extra-large ASUS ROG Sheath mouse pad is so big that you can put your keyboard on top of it too. I think it will pair well with the ROG Spatha – retails for $69. The Sheath has a smooth surface that perfectly ensures pixel-precise tracking and a non-slip ROG-red rubber base that ensures it stays put.